I learned today of the death of Bill Mandle. He and I are connected in many ways even though we did not meet in person. Most recently, my remarkable PhD students, Robin Poke and Bruce Coe, inducted me into his work and alerted me to his connections with Sport Studies at the University of Canberra. Brian Stoddart (2009) provides some background to Bill’s time at the Canberra College of Advanced Education “were he created the Centre for Sports Studies to support educationally the new Australian Institute of Sport” (p.67). Brian describes Bill as “physically towering with blazing eyes, mercurial intellect and unpredicatable temperament” (p.67). Brian notes Bill’s role in the first Sporting Traditions Conference held in Sydney in 1977. Darryl Adair (2013), amongst others, has noted the seminal importance of the Conference for the intellectual foundations of sport history. 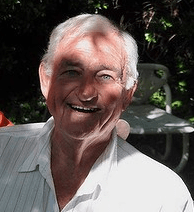 Bill was appointed an Emeritus Professor of the University of Canberra in 2000. Robin Poke, with the help of Doug Booth and Ron Miller, has compiled a very sensitive obituary. I include extracts here with Robin’s permission. After retiring from University life, Bill taught in U3A. He moved to Moruya Heads where he died at the age of 80. There is a wake for Bill in Canberra on 3 June. Many of his sport history friend will be there. ‘If I have been able to see farther’, physicist and mathematician Isaac Newton is reputed to have said, ‘it is because I have stood on the shoulders of giants’. For many sports historians in Australia, Bill Mandle was their giant. This is a second post in a record of planning for the centenary of the Royal Henley Peace Regatta . An introductory post can be found here. One of the planning group, Ross Gibson, has followed up on finding this picture of the Australian crew crossing the finishing line with his reflection on War, Water and Afterwards. I include his reflection here with his permission. All my work examines how the past pushes through the present to render possible phenomena and behaviours available for the future. This liveliness of the past can be found at the psychological level, in the ways individuals are constructed or ‘poised to act’ by their accrued experience. Or at the material level, everything that has already happened to any batch of matter affects how ductile and malleable that matter will be in the coming moments. And at the CULTURAL level of course, entire communities carry a kind of formative code through the rituals, memory-practices, and representations or models of the world that people make and maintain together through collaborative, creative and ceremonial practices. It’s this last level — the cultural — that interests me most of all. For the past couple of years I’ve been thinking about how we can understand defining aspects of society by first choosing some particular ‘crucial element’ that is common to everyone’s experience and by then examining cultural activities and memory-practices that typically get applied to that element within the society over significant stretches of time. The chosen element becomes a lens through which to scrutinise the larger world. For example, imagine investigating the dynamics of a society by concentrating on the various ceremonial and cultural practices that people make and maintain around water. How might a long-duration examination of the cultural activities associated with water help us see some of the ‘throughlines’ of psychological, political and materially-predetermined influence that give shape to human experience? And what particular long duration of time might we choose so that the water-focused insights that get generated are particularly pointed and telling? In other words, what’s an intensely informative run of historical time within which we could profitably examine some cultural practices and presumptions around water? After mulling over these many questions, I’ve decided to concentrate on the cultural significance of water in European-influenced (or ‘Western’) societies during the decades leading up to and out of 1919, the year immediately after the conclusion of World War I. This is the year when all the cultures and psychologies in the world had to begin to understand what had just happened so catastrophically within the psychological and socio-political make-up of humanity, such that people had killed each other in modern, industrial ways that had never before stained human culture. How had the great promise and optimism of the machine-age and Industrial Revolution delivered this disaster? Was it possible to imagine a healthy human culture ever arising again from the blood, mud and filthy inundations of trench and tank warfare? It is now clear that 1919 is a crucial year in cultural history. From this year we can see the first versions of so many artistic and literary movements that went on to define the Twentieth Century. We can see, for example, cubism, vorticism, suprematism and Russian Revolutionary art movements being invented. We can see literary modernism developing, with writers such as Ezra Pound and T.S. Eliot beginning drafts of writing which would eventually become The Cantos and The Waste Land, works that tried to show and understand the wrenching chaos and cruelty that the world had come through. And politically, of course, by 1919 the traumatic aftermath of the Great War had set the scene for the rise of the visionary (and ultimately tragic and often squalid) experiments in social reconfiguration that saw the installation of socialist and communist regimes across the globe. All these responses to the chaos of WWI are superbly analysed in James Mellard’s book The Exploded Form, in which he argues that the period immediately after the war saw artists, writers, philosophers and political theorists attempting to find new forms of expression and organisation that somehow ‘mirrored’ the literally explosive and cataclysmic experiences that the Great War had smashed down upon humanity. Clearly, 1919 is one of the most important years in the Twentieth Century. Equally clearly, an examination of the decades that lead up to and out of that particular year will grant us deep insights into many of the motivating forces in human experiences in the modern era, right up to the present day. Apply two lenses to a cultural-historical investigation of human experience: examine how water is represented across many facets of human experience AND use the year 1919 as an organising focus for that examination. See what comes of it, what can be learned from the application of these two, overlaid lenses. What I’m finding is that that this dual-lens approach gives me a way to get to intense instances of personal, everyday experience. The method helps me and my readers (or viewers, in that case of the films and museum exhibitions that I make), it helps my my reader and viewers think about how water — this fundamental element of everyday existence — runs through and gives shape to ALL human experience, how it MAKES fundamental human experiences and how the forces of history push on these basic elements to generate the chain reactions of influence and reactions that constitute reality on a daily basis. So, what’s a specific example of how this approach can work? As luck would have it, I’ve been introduced to Sports History specialists at the University of Canberra. Keith Lyons, Robin Poke, Bruce Coe. These scholars have been developing a project about the Royal Henley Peace Regatta of 1919. Do you know about it? In the immediate aftermath of the war, there were thousands of armed forces from all over the British Empire detained in England awaiting security clearances and demobilisation. 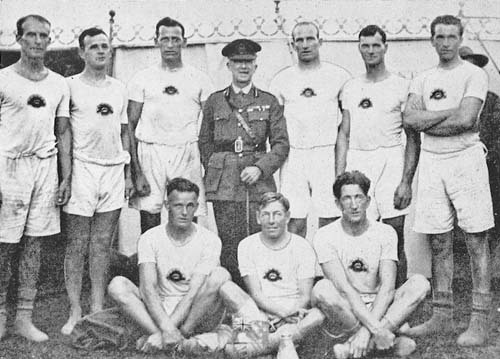 As part of the rehabilitation of these troops, the Royal Henley Regatta decided to invited military crews to compete against Oxford and Cambridge in the 1919 Regatta. As it turned out, the Australian eight — a crew drawn from many states and classes — won the final. With the 2019 Centenary of the Peace Regatta looming, there is a plan to commemorate the original race and the participants. 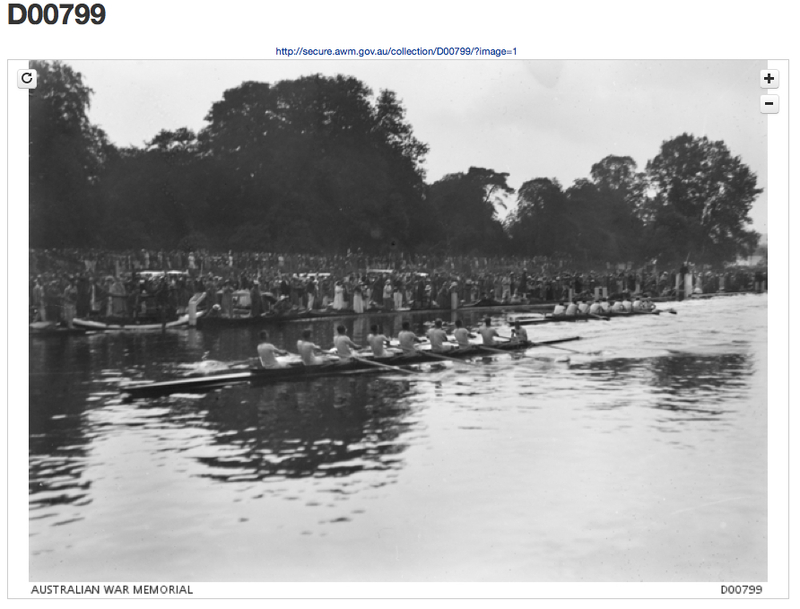 So I’ve started to examine the Regatta through the lenses of the cultural significance of water and 1919. The Regatta strikes me as very ‘telling’ and very poignant — all that lulling water on the Thames, all that mayhem and sad inundation in mucky blood and mud and slosh that these men had recently survived in the trenches, all the elemental struggles that the Australians were about to return to as so many of them contemplated returning to farm on soldier-settlement blocks where drought and flood would almost immediately become these ex-warriors’ unstinting, sinister enemies every day. Consider the image of these war-weary soldiers afloat in these fragile craft, held so delicately in this brittle, new peacetime. This image helps us understand so much about the past, present and future for everyone struggling to come back to life after the Great War. I have yet to research it all thoroughly, but I expect there will be a narrative line that can be drawn backwards and forwards in time out of the Regatta, through some particular crew-member or support personnel, linking deeply-moving wartime tales to the looming experience of some particular soldier-settlers. I expect to find a ‘water line’ of poignant narrative, in other words. And I expect that this water-drawn storyline might be an intriguing way in to the big issues of after-war life-struggles for the soldier-settlers. The UC Sports History scholars are already negotiating with several different cultural institutions to produce exhibitions, books, films and website responding to the history and the centenary of of the 1919 Regatta. It seems like an opportunity that just has to be seized. 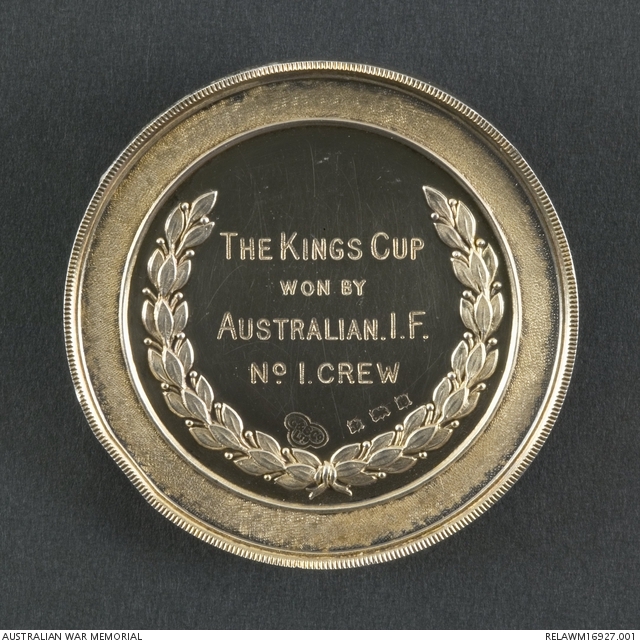 On Saturday 5 July 1919 a crew from the Australian Imperial Force defeated Oxford University at the Royal Henley Peace Regatta to win the King’s Cup. Andrew Guerin has provided a very detailed account of the Regatta and the months of training leading up to it. He notes that ‘Fred House and Arch Robb rowed stroke and seven in the winning Tasmania crew in 1914, while Mettam rowed for WA, Scott for SA, and Disher for Victoria in that year. Hauenstein and Middleton were, of course, Olympic oarsmen (Stockholm 1912)’. A number of groups are planning to celebrate the Centenary of the Regatta. Two Canberra sports historians, Robin Poke and Bruce Coe, will be involved in these celebrations. One part of these celebrations will involve Robin and Bruce working with Ross Gibson and me to explore ways to share the story of the Regatta and the AIF Crew. 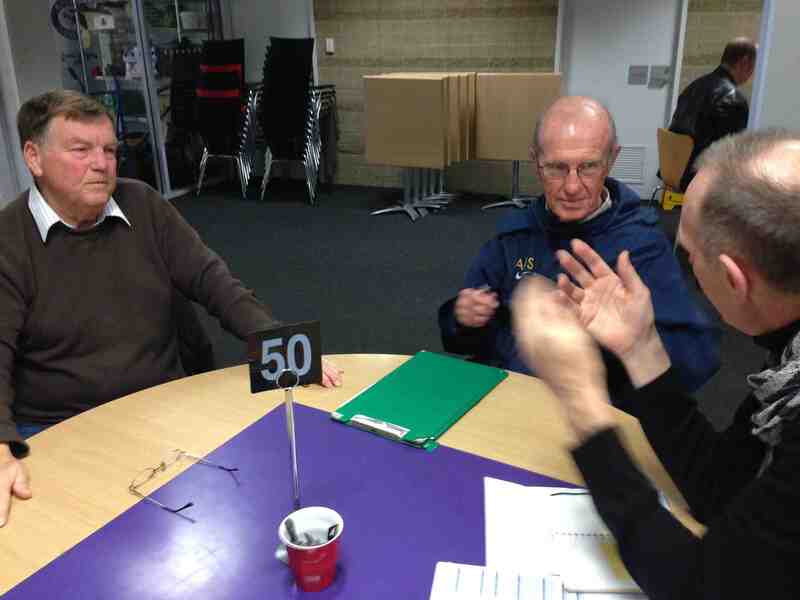 We held our first meeting this week at the University of Canberra. One of our ideas is to document the emergence of our celebration plans. This is my first note in a four-year project. My particular interest is in how we might develop powerful, interactive narratives about the Regatta and the crew. We agreed that 1919 itself was a very important year. it was a time of transition (the Australian Imperial Force was in Europe after the end of World War 1) and transformation. Each of us discussed how our interests in transition and transformation might be explored in our project. We agreed that there were remarkable stories to share about the crew, the Regatta and the place of sport in Australian life. All of which makes for an exciting four years. Our next meeting is in June.